Powerful and inspiring: two great words to describe Day 2 of And Justice for All. Today was full of intense discussions, heartfelt story telling, stirring music, and planning for the future. That's #NIIC 2017! We're all quite aware that we're operating in an historically difficult moment. Our two Plenaries today -- Building Alliances In Difficult Times and And Justice For All: A Year of Fierce Resistance and Solidarity Brings Us to 2018 -- dove deep into this reality and offered up tactics, strategies, and hope. Guy Reiter of the Native Organizers Alliance summed up a strategy to face the challenges before us: Adapt. Overcome. And continue to love. Tomorrow's first Plenary which will look beyond our own border -- Global Migration and the Rise of Nationalism -- kicks off a bit earlier at 8:30am, so come down for some coffee before hand and grab a good seat. Then you've got another two rounds of Track sessions on either side of our lunch Plenary -- The Path Forward: Organizing & Democracy -- to choose from. If you're heading out early, thanks again for joining us and safe travels! If you're with us until the final bell, don't miss our closing and special performance at 3:15pm in the main NIIC plenary room. We're thrilled to have you join us here in Phoenix and we hope you enjoyed your first day at NIIC! We're just getting started. Each day we'll provide you with some quick updates and preview some events for the next day to help you get the best out of your NIIC experience. 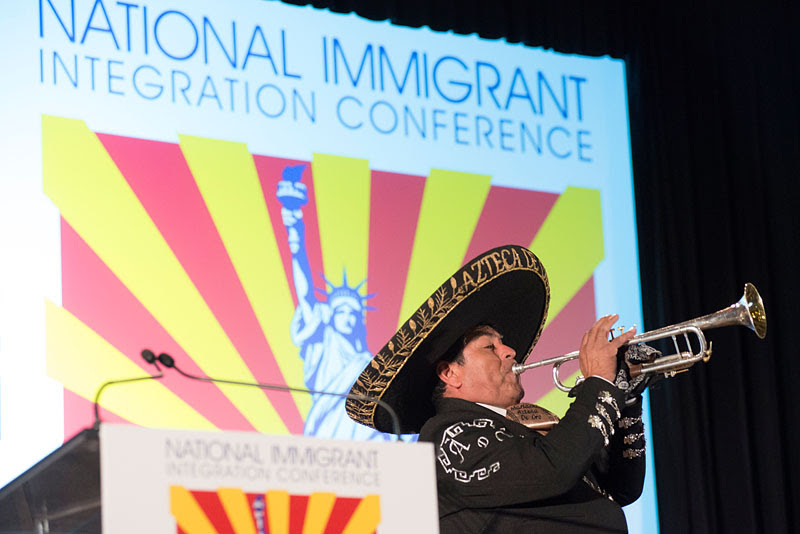 Our opening Plenary of the conference, The Arizona Story, featured honest talk about lessons learned from Arizona's fights against anti-immigrant attacks, how this advocacy influenced the national movement, and what's possible going forward. The Plenary, as Petra Falcon noted, kicked-off a conversation that reflected why over 1,000 of you came to Arizona and why this moment is so important to us. "The story our six panelists have to tell, lifts up the struggles we have fought, the lessons we have learned, claims our wins, but also reflects on these fights. We have not won yet. But, all of us, have built a movement that is still growing in Arizona and has birthed leadership envied by a nation." If you missed this dynamic discussion, check out NIIC Facebook for the live streaming we posted. We start bright and early tomorrow! Make sure you have your badges and join us for breakfast and the first of two Monday Plenaries, Building Alliances in Difficult Times at 9am. Like you, the NIIC social media team can't be everywhere at once, so join the conversation on Twitter, Facebook, and Instagram using #NIIC2017 to discover what's going on in other sessions and what is inspiring your NIIC peers. If you didn't get a chance to explore the NIIC Expo today, we encourage you to make time tomorrow. The Expo is a vibrant space for artists, organizations, and businesses to showcase their vision, art, and advocacy. The Expo is split into two locations -- one on the 2nd floor (200 near the Track sessions) and the other on the 3rd floor (300 level) in front of the Plenary/NIIC mainstage room. The Expo is open from 8:00am to 6:00pm on Monday and 8:00am to 5:00pm on Tuesday.